No matter whose fault it is or who has the right of way, if you can avoid being involved in a truck accident you are much better off. While you do not have control over the underlying causes of truck accidents, understanding how they occur can help you stay out of them. If you have been injured in a crash with a large commercial vehicle, our truck accident attorneys can help. Big trucks have blind spots. Truck drivers are taught how to look for other vehicles and how to anticipate when a car is likely to be in a blind spot, but under hazardous weather or traffic conditions, it is easy for even the most experienced truck driver to make a mistake. You can protect yourself by simply never counting on the truck driver to just “know” where you are. If you cannot see the driver through a window or in his mirrors, you are in a blind spot. Since trucks are so long, they have to make wide right turns. What that means is that they swing out to the left just before turning right. That gives other drivers a chance to pull into the empty space on the right side of the truck. Unfortunately, this is a good place to get crushed, and it is in the truck’s blind spot. Like the rest of us, truck drivers are required to signal before turning. However, sometimes they forget and sometimes turn signals are faulty. If you see a truck swing out to the left, just hang back and wait. It could save your life. Big rigs are heavy. They require quite a bit of stopping distance when they are in the best condition. If there is any kind of problem, such as bad brakes or a load that is too heavy, they need even more. Always give a truck extra room when passing. Most truckers will flash their lights to let you know it is safe to pull back into their lane. If you or a loved one has been injured or killed by in a truck accident, please call our truck accident attorneys. The initial consultation with our truck accident attorney is free, and if we agree to represent you, we will work for a contingent fee, which means we won’t get paid for our services unless you receive a settlement or an award. 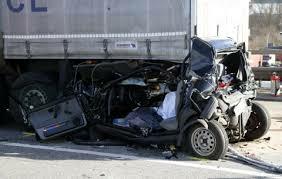 A truck accident lawsuit must be filed before the expiration of the statute of limitations. Please call right away to ensure that you do not waive your right to possible compensation. HOW DO I CHOOSE THE RIGHT ATTORNEY? What are your consumer rights? Copyright 2018 Lawyers Blog | All Rights Reserved. Driving School Theme.